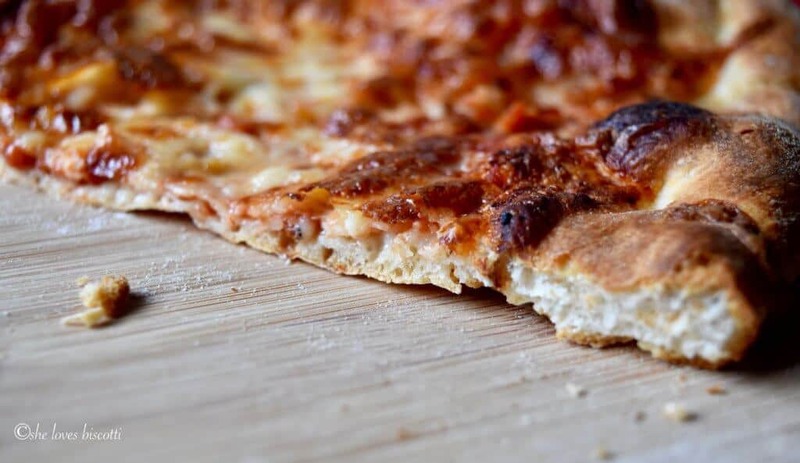 Use quality ingredients to achieve a thin or thick crust pizza with this recipe for the Best Homemade Italian Pizza di Angela. Here is another one of my go-to recipes which will demonstrate how the strength of the dish is in the quality of the ingredients used. So, what defines a pizza as being great? Is it only the use of quality ingredients or is there more to it than that? Is it the thickness of the pizza crust? Is it the type of flour used to make the dough? Is it the tomatoes used to make the pizza sauce? Is it the type of oven? I’ve often wondered about what defines a pizza as being great. It doesn’t keep me awake at night, but the reality is that I had an Italian upbringing where homemade pizza was a frequent occurrence and like all food that was served, it was taken very seriously. 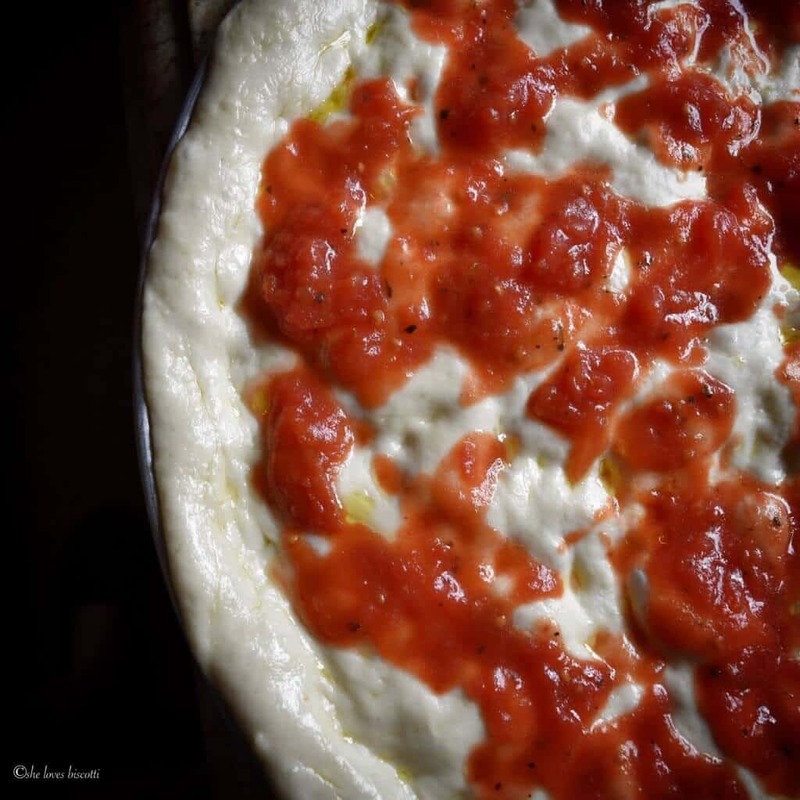 The pizza sauce: When I am making pizza sauce, I will always start with canned whole peeled San Marzano tomatoes that are stamped «product of Italy». If available in your region, make sure to purchase canned tomatoes which have been certified DOP. If you are interested, Serious Eats has a great article on the DOP tomato. The tomatoes are sweet, the quality is consistent and I just love the convenience. I will empty the contents of a 28 ounce can in medium sized bowl and crush the tomatoes with my fingertips. I do not use my blender, nor do I strain the tomatoes. There is also no need to cook any pizza sauce. I will then add a few minced fresh garlic cloves, a bay leaf, some good quality extra virgin olive oil, a tablespoon or so of freshly chopped Italian parsley and about a teaspoon of dried oregano (I use Litehouse «nonsponsored» and yes, I do prefer dried oregano when it comes to making pizza sauce). A sprinkle of red pepper flakes will also be added depending on who is around for the pizza party (you know who you are 😉 ). Now, we can probably have an hour long discussion just on the topic of pizza sauce… and in my humble opinion, there is no right or wrong… as always, it is a matter of personal preference. Once the ingredients are combined, set aside for at least thirty minutes before spreading on your pizza. This time will allow the flavors to blend. Unused pizza sauce can be refrigerated for up to three days or frozen. 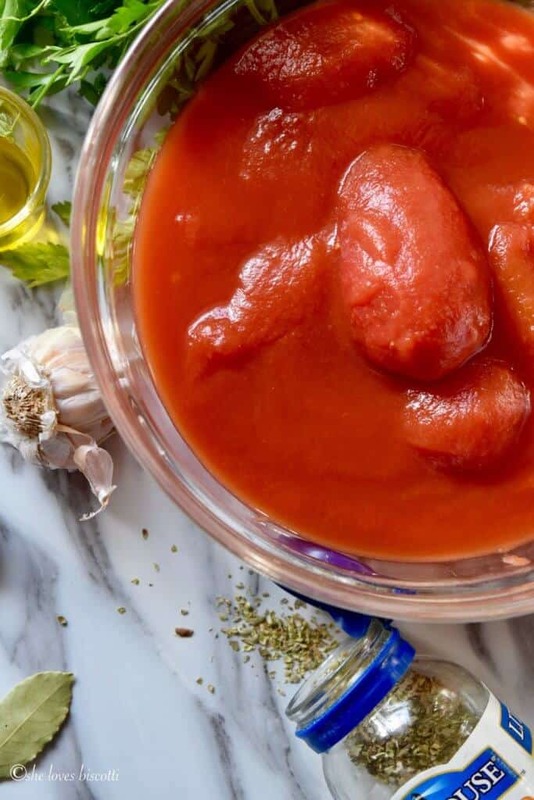 This pizza sauce takes less than 5 minutes to prepare and the quality is so much better than any store bought pizza sauce. Once you will try it, you will never go back. I almost forgot to mention that when you are spreading the pizza sauce on your dough, don’t overdo it. Just drop heaping tablespoons of pizza sauce on the dough purposely leaving some of the dough uncovered. Remember, go easy on the toppings otherwise you are guaranteed a soggy pizza crust. 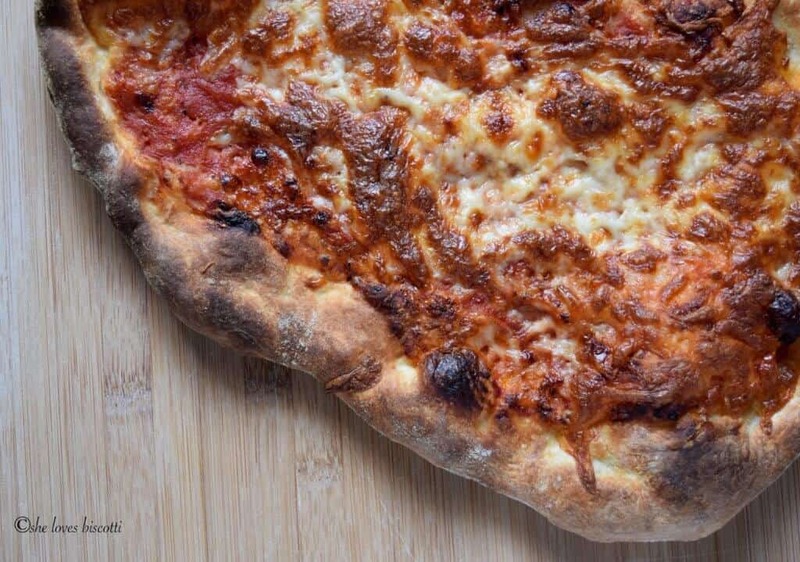 The pizza dough: Any great pizza starts with a great pizza dough. 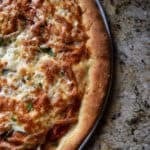 I recently shared this Easy Homemade Pizza Dough recipe with all of you. 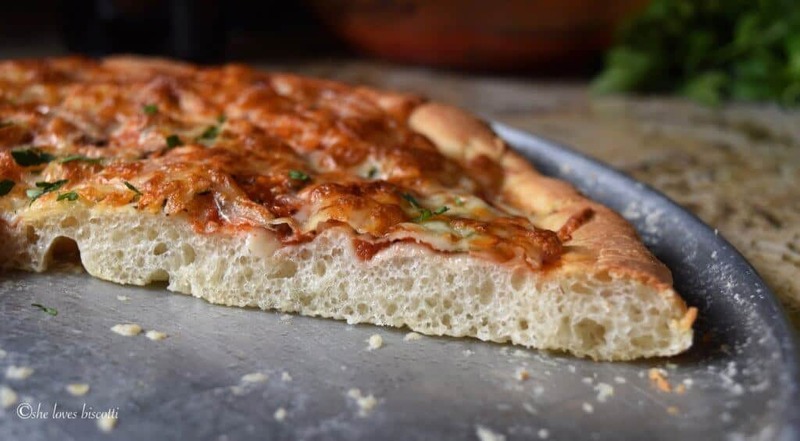 This pizza dough recipe is so versatile that you can make a thin crust pizza or, if you prefer, a soft, chewy, thick pizza crust. Remove from oven and allow pizza to set before slicing. Repeat the procedure for the rest of the pizza dough. A hot, thin and crispy pizza crust, fresh from the oven, is my husband’s definition of a great pizza. Whether you prefer to make a thin or thick crust pizza remember to always bake your pizza in a very hot oven. Last week, I shared my mom’s pizza dough recipe with all of you. 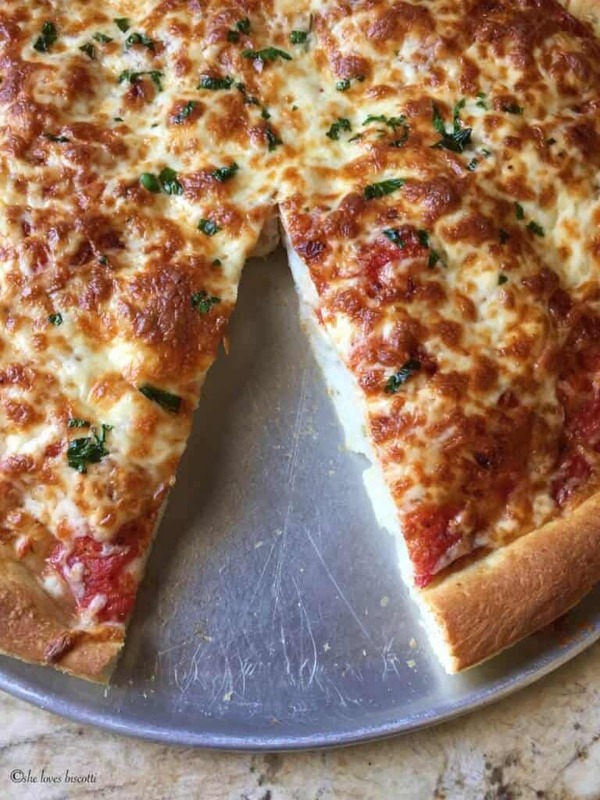 It is my go to recipe whenever I am making a thin or thick crust pizza. My mom would usually top her pizza dough with her homemade pizza sauce, a little Parmigiano-Reggiano cheese and of course some mozzarella. That’s it. Super simple and tasty. 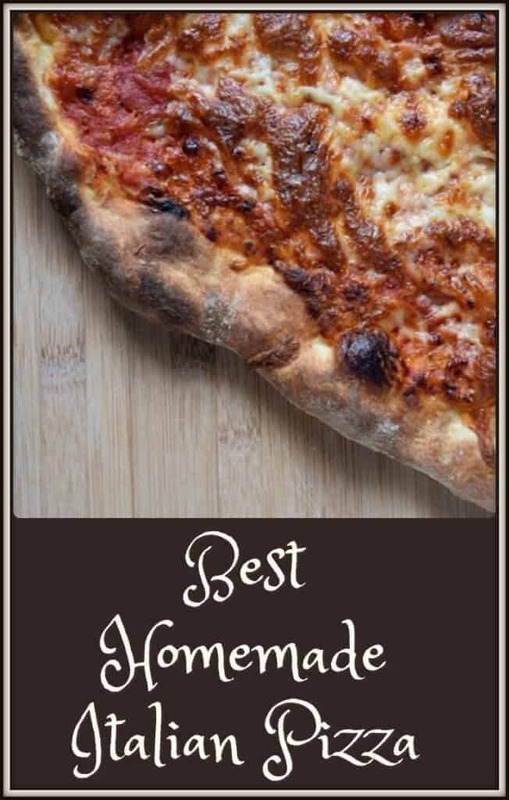 This recipe for the Best Homemade Italian Pizza di Angela was a family favorite when I was growing up and still is to this day! A soft, chewy, thick pizza using fresh ingredients is my definition of a great pizza. 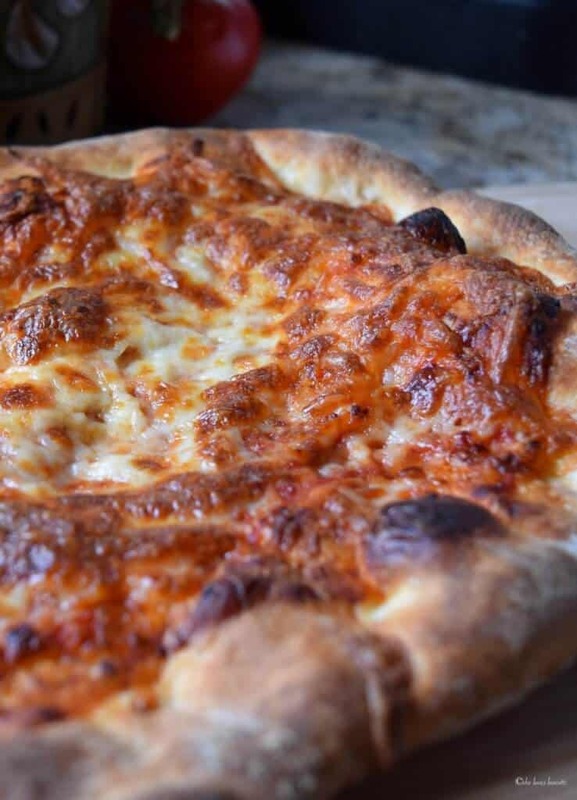 As you can probably guess, everyone has their own definition of a great pizza, what’s yours? 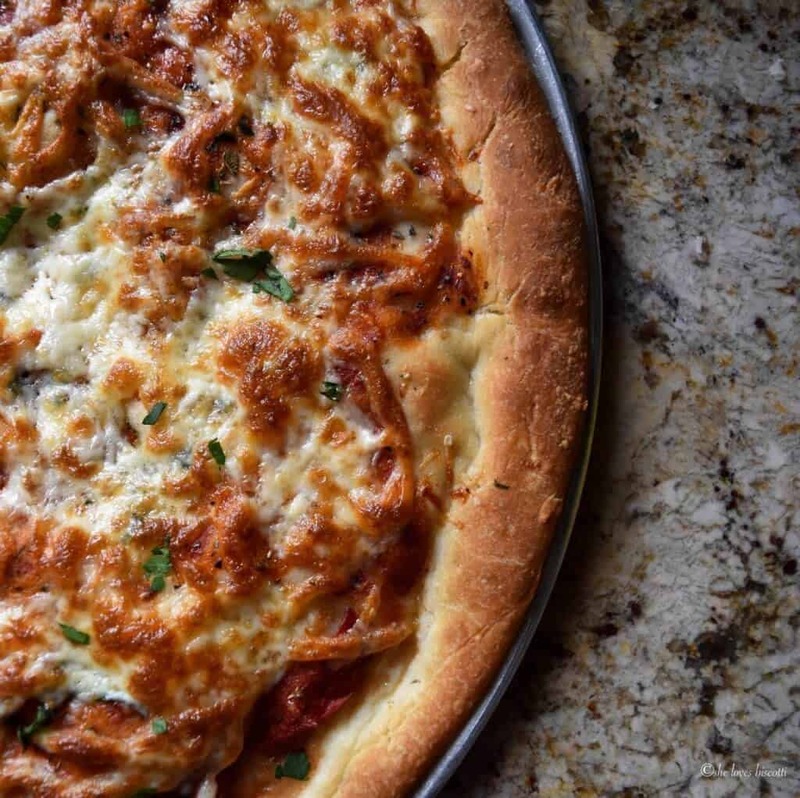 Use quality ingredients to achieve a thin or thick crust pizza with this recipe for the Best Homemade Italian Pizza di Angela. Make the pizza dough the same day you are planning to bake your pizza (for detailed instructions please refer to scenario #2 of the post entitled Easy Homemade Pizza Dough. Sprinkle pizza sauce on top of the pizza dough, followed by a drizzle of olive oil and 2 tablespoons of freshly grated Parmigiano-Reggiano cheese. Bake the pizza for about 13-15 minutes or until sauce is bubbly and crust is beginning to darken. Remove pizza from the oven, sprinkle about 1 cup grated mozzarella and place in the top third of the oven. Bake for 3-5 minutes until mozzarella is melted and slightly browned. Make the pizza dough 24 hours before planning to bake your pizza. Refrigerate the dough (if your dough is frozen, just let it thaw out in the fridge). Remove the pizza dough from the refrigerator (the day you are baking the pizza) and keep at room temperature for about 15-20 minutes. Working with one half of the pizza dough, place on a lightly floured wooden board and gently stretch out the dough. It does not have to be a perfect round. I keep a bowl of olive oil nearby, dip my fingers and start by forming a lip, then gently stretch out the dough with your olive oiled fingertips. Transfer the glistening flattened pizza to a pizza peel, making sure it can slide off easily when transferring to the pizza stone. Sprinkle about half of pizza sauce on top of the pizza dough, followed by a drizzle of olive oil and about 1 tablespoon of freshly grated Parmigiano-Reggiano cheese. Slide onto the pizza stone. With the help of a pizza peel, remove pizza from oven. Spread half grated mozzarella and place directly on the oven grates in the top third of the oven. Bake for 2-3 minutes until mozzarella is melted and slightly browned. Repeat procedure for remaining dough. 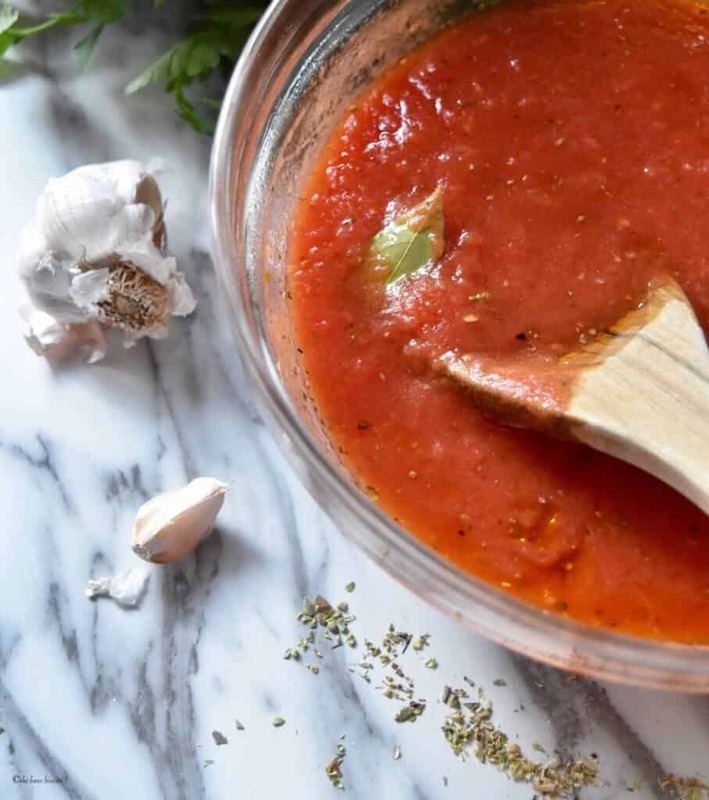 Once you try this Homemade Pizza Sauce, it will quickly become your go to sauce. In a medium bowl, crush tomatoes with finger tips. Allow to sit for about 30 minutes for the flavors to combine. Discard bay leaf when ready to use to top your pizza. Unused sauce can be kept in the refrigerator for up to 3 days or frozen. This is by far the best the best pizza crust I ever made! I really appreciated the trick to quickly rising the dough in the oven. It worked! Thanks! Thanks for posting this recipe! Also the pictures are great! Pleas tell me what a pizza peel is? 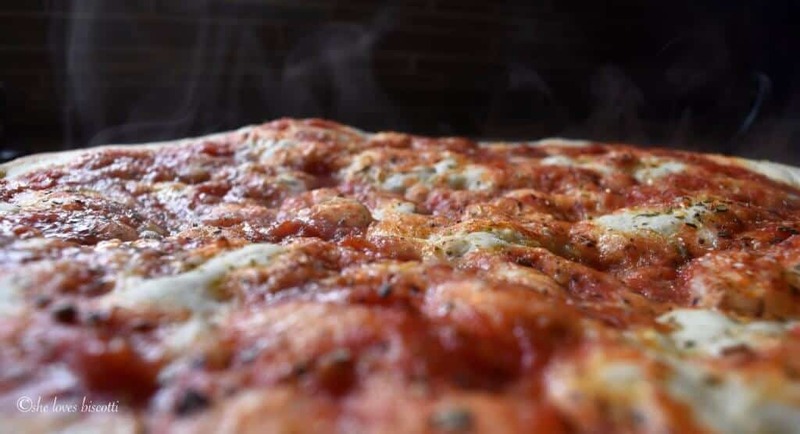 As an avid pizza maker, complimenti on your tips for readers as they are spot on! The photos are all so inviting however the one featuring the dimpled dough with tomato sauce is absolutely spectatular. Thank you so much Paula. Pizza is truly such a wonderful food. Thanks for taking the time to comment! I made your pizza dough recipe on Thursday, stored it overnight in the refrigerator and used the dough for pizza last night. It turned out very well. We liked it a lot. Thanks for sharing.